The plane of Ravnica is an endless metropolis where ten two-color guilds vie for authority. Return to Ravnica takes Magic back to this beloved setting, and with it, brings back multicolored cards in a big way. This set features five of the ten two-color guilds: the white-blue lawkeepers of Azorius, the blue-red experimenters of Izzet, the black-red maniacs of Rakdos, the black-green scavengers of Golgari, and the green-white nature-tenders of Selesnya. Each guild has its own philosophy, its own strategy, and its own signature mechanic. Gold cards are straightforward. 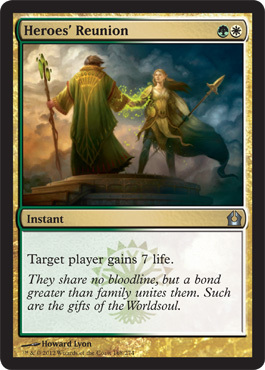 Heroes' Reunion is both green and white, and you need one green mana and one white mana to cast it. Anything that affects green spells or white spells will affect it; anything that affects, say, "nonwhite" spells won't affect it, because it is white, even if it's also another color. Also appearing in Return to Ravnica are hybrid cards, which made their debut in the original Ravnicablock. You can pay a hybrid mana symbol like by paying one mana of either of its two colors—in this case, or . You don't have to pay the same kind of mana for all the hybrid mana symbols on one card. So you can cast Rakdos Shred-Freak for , , or . 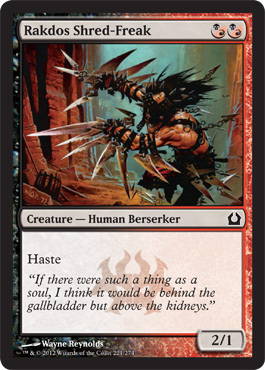 No matter what color or colors of mana you use to cast it, Rakdos Shred-Freak is always black and red. "Gold" and "hybrid" aren't colors, nor is "multicolored." But some effects might refer to multicolored cards. That includes any card with more than one color, so it will affect both hybrid cards and gold cards. The Azorius are champions of law and defenders of justice, and their signature mechanic, detain, lets you lock away offenders. When you detain an opposing permanent, until your next turn, that permanent's activated abilities can't be activated and (if it's a creature) it can't attack or block. Activated abilities are the ones that have a colon (:) in them, such as " : Add one mana of any color to your mana pool" or "Equip ( : Attach to target creature you control. Equip only as a sorcery.)" If the permanent has any other abilities—say, "Equipped creature gets +1/+0 and has flying" or "Whenever a creature attacks you or a planeswalker you control, that creature's controller loses 1 life"—those abilities still work as usual. Detaining a creature that's already attacking or blocking won't cause it to stop attacking or blocking, and detaining an Equipment that's attached to a creature won't cause it to become unattached. If the detained permanent leaves the battlefield, it's no longer detained, even if it returns to the battlefield somehow before your next turn. 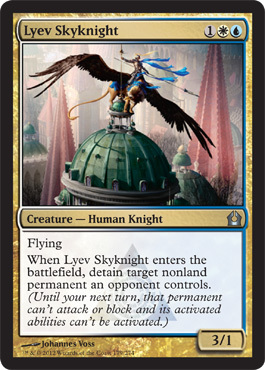 If you detain a permanent as a result of Lyev Skyknight's ability (or the ability of another permanent), it doesn't matter what happens to your permanent—the detained permanent is locked down until your next turn. A guild of mad scientists, inventors, and frequent explosions, the Izzet are always willing to step it up a notch. The overload mechanic lets them power up their instants and sorceries to huge proportions by taking every instance of "target" in their rules text and replacing it with "each." 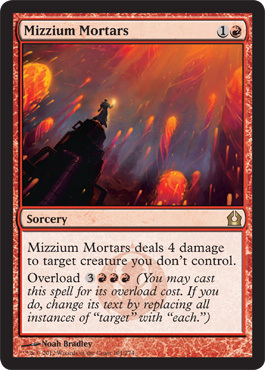 If you cast Mizzium Mortars for its normal mana cost of , it's just what you'd expect—it deals 4 damage to target creature you don't control. But if you can pull together to pay its overload cost, your opponent's creatures had better watch out! That's 4 damage to each creature you don't control, which should clear out most opposing creatures. Some overload spells in Return to Ravnica, like Mizzium Mortars, have harmful effects, while others have beneficial effects. The harmful ones all target things you don't control, and the beneficial ones all target things you do control. That way, the overload will always give you more of what you want, and none of what you don't. The crazed cultists who follow the demon Rakdos are fervently devoted to mayhem and destruction. The unleash mechanic is a crucial weapon in the Rakdos arsenal. You can choose to have a creature with unleash enter the battlefield with a +1/+1 counter it. As long as it has one or more +1/+1 counters on it, it can't block—no matter how it got +1/+1 counters. But if your creatures are all bigger than normal, why waste time blocking? 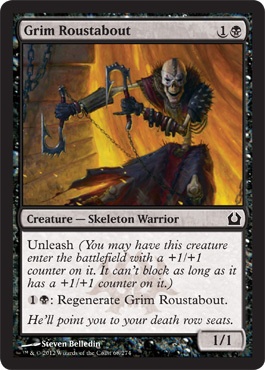 Grim Roustabout is a two-mana 1/1 that regenerates for . And sometimes, hey, that's what you need. But if you're not into blocking, you can instead choose to have it enter the battlefield as a two-mana 2/2 that regenerates and can't block—a pretty mean attacker. The rotting minions of the Golgari lurk beneath the streets of Ravnica, endlessly recycling the city's leavings. Thanks to the scavenge mechanic, a creature keyword that works from the graveyard, even the fallen can feed the swarm. 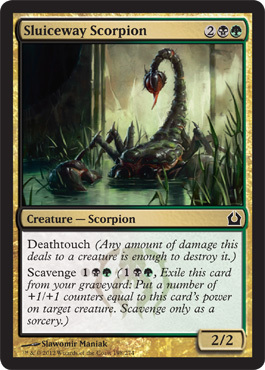 You can activate the scavenge ability of a creature card in your graveyard any time you could cast a sorcery by exiling it and paying its scavenge cost. That lets you put a number of +1/+1 counters equal to the scavenged creature's power onto a target creature. You can't activate a scavenge ability unless there's a creature you can target with it. If you activate a scavenge ability targeting a creature and then the creature leaves the battlefield or becomes an illegal target some other way (say, by gaining protection from one of the scavenged card's colors), the creature won't get any counters, but the creature card you scavenged will still be exiled. The Selesnya revere nature and growth, and seek to restore parts of Ravnica to their natural state. Thepopulate mechanic puts a copy of one of your creature tokens onto the battlefield. Like many (although not all) populate cards, Eyes in the Skies gives you a token to get you started. So first you'll put a 1/1 white Bird creature token with flying onto the battlefield, then you'll choose a creature token you control to get a copy of. That means you can choose your new Bird token and get a second Bird token—but you don't have to. If you control some other token you'd rather have a copy of—say, a 4/4 green Rhino with trample—you can get another one of those instead! If you have a token that's already a copy of something, perhaps because of Rite of Replication or Spawnwrithe, you could even choose that. 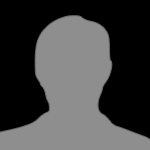 The copy of your token is a separate token, and isn't affected by anything that happens to the first token before or after you copy it. 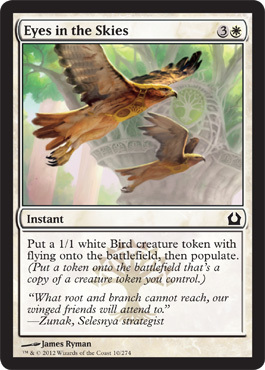 For example, if you cast Giant Growth targeting a 1/1 white Bird token with flying, then populate and copy the Bird token, the new Bird will just be a 1/1, even though the original was a 4/4 when you copied it. Populate doesn't target anything, and you don't have to choose a token to copy until you're actually populating. For example, say you control a 1/1 white Bird token with flying and a 4/4 green Rhino token with trample, and you cast a spell that populates, planning to copy the Rhino token. Your opponent casts Doom Blade in response to kill the Rhino. When your spell resolves, you'll still be able to choose the Bird token. Your opponent can't wait until you choose which token to copy and then kill that one; by that time, your spell is already resolving, and it's too late to cast Doom Blade. Gold cards can put a strain on your mana, so Return to Ravnica features common "dual lands"—lands that can tap for either of two different colors of mana—called Gates. Ordinarily, Ogre Jailbreaker is a 4/4 defender—a pretty big roadblock, but not actually capable of helping you win the game. 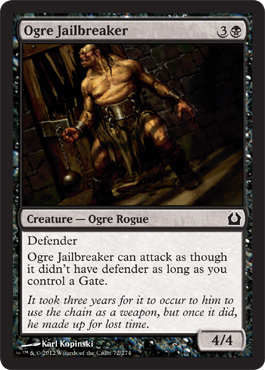 But if you control a Gate—any Gate, no matter what colors it produces—Ogre Jailbreaker can attack, making it a fully functional 4/4 for just four mana.